Researchers at PNNL developed a novel electrolyte for vehicle batteries that successfully creates a protective layer around electrodes — so they won't corrode — achieving significantly increased charge/discharge cycles. RICHLAND, Wash. — When it comes to the special sauce of batteries, researchers at the Department of Energy's Pacific Northwest National Laboratory have discovered it's all about the salt concentration. By getting the right amount of salt, right where they want it, they've demonstrated a small lithium-metal battery can re-charge about seven times more than batteries with conventional electrolytes. A battery's electrolyte solution shuttles charged atoms between electrodes to generate electricity. Finding an electrolyte solution that doesn't corrode the electrodes in a lithium-metal battery is a challenge but the PNNL approach, published online in Advanced Materials, successfully creates a protective layer around the electrodes and achieves significantly increased charge/discharge cycles. Conventional electrolytes used in lithium-ion batteries, which power household electronics like computers and cell phones, are not suitable for lithium-metal batteries. Lithium-metal batteries that replace a graphite electrode with a lithium electrode are the 'holy grail' of energy storage systems because lithium has a greater storage capacity and, therefore, a lithium-metal battery has double or triple the storage capacity. That extra power enables electric vehicles to drive more than two times longer between charges. Adding more lithium-based salt to the liquid electrolyte mix creates a more stable interface between the electrolyte and the electrodes which, in turn, affects the life of the battery. But that high concentration of salt comes with distinct downsides — including the high cost of lithium salt. The high concentration also increases viscosity and lowers conductivity of the ions through the electrolyte. "We were trying to preserve the advantage of the high concentration of salt, but offset the disadvantages," said Ji-Guang "Jason" Zhang, a senior battery researcher at PNNL. "By combining a fluorine-based solvent to dilute the high concentration electrolyte, our team was able to significantly lower the total lithium salt concentration yet keep its benefits." In this process, they were able to localize the high concentrations of lithium-based salt into "clusters" which are able to still form protective barriers on the electrode and prevent the growth of dendrites — microscopic, pin-like fibers — that cause rechargeable batteries to short circuit and limit their life span. PNNL's patent-pending electrolyte was tested in PNNL's Advanced Battery Facility on an experimental battery cell similar in size to a watch battery. It was able to retain 80 percent of its initial charge after 700 cycles of discharging and recharging. A battery using a standard electrolyte can only maintain its charge for about 100 cycles. 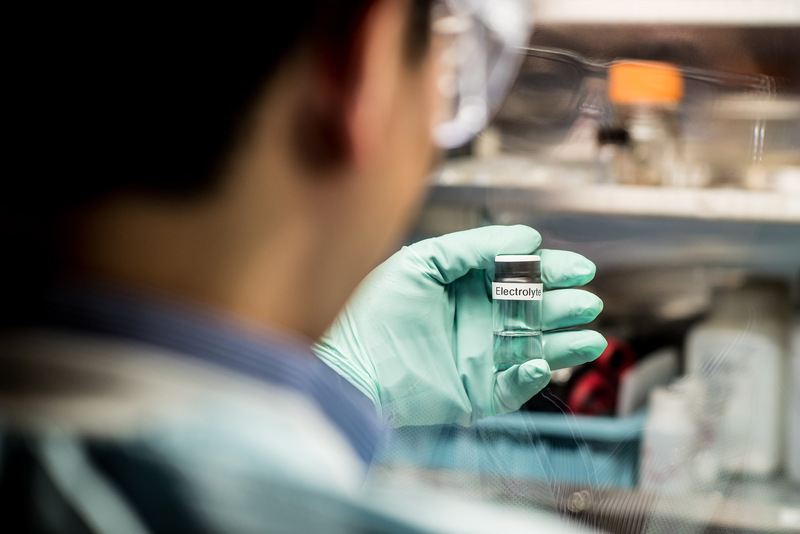 Researchers will test this localized high concentration electrolyte on 'pouch' batteries developed at the lab, which are the size and power of a cell phone battery, to see how it performs at that scale. They say the concept of using this novel fluorine-based diluent to manipulate salt concentration also works well for sodium-metal batteries and other metal batteries. This research is part of the Battery500 Consortium led by PNNL which aims to develop smaller, lighter, and less expensive batteries that nearly triple the specific energy found in batteries that power today's electric cars. Specific energy measures the amount of energy packed into a battery based on its weight. This research was supported by the Department of Energy's Office of Energy Efficiency and Renewable Energy's Vehicle Technologies Office. Researchers performed microscopy and spectroscopy characterizations of battery materials at EMSL, the Environmental Molecular Sciences Laboratory, a DOE Office of Science user facility at PNNL. Reference: Shuru Chen, Jianming Zheng, Donghai Mei, Kee Sung Han, Mark H. Engelhard, Wengao Zhao, Wu Xu, Jun Liu and Ji-Guang Zhang, High-voltage lithium-metal batteries enabled by localized high concentration electrolytes, Advanced Materials, Mar. 25, 2018, DOI: 10.1002/adma.201706102.